(NaturalNews) A preservative chemical that's routinely added to hot dogs, beef jerky, bacon and breakfast sausage is now being deployed by government researchers as a fatal bait to poison wild hogs to death. Development of the deadly hog poison is being pursued by none other than the U.S. Department of Agriculture, the same agency that legalizes the same toxic chemical to be used in processed meat products approved for human consumption. The chemical, known as sodium nitrite, is a cancer-causing "color fixer" and meat preservative added to processed meat products to give them a pink hue that consumers mistake for being "fresh." When sodium nitrite combines with the hydrochloric acid (HCl) found in stomach acid, it forms cancer-causing nitrosamines. These nitrosamines go on to directly promote pancreatic cancer, colorectal cancer, leukemia, brain tumors and other cancers throughout the body -- facts that I have been warning readers about for over a decade. Sodium nitrite is the reason why processed meats drastically raise the risks of cancer, heart disease and diabetes. Eating sodium nitrite, in other words, is a lot like eating a slow death in the form of cancer. But in feral pigs, the same chemical kills quite rapidly. A paper posted online by the USDA states, " The toxin, sodium nitrite, a common meat preservative that prevents botulism, had previously been shown to be a quick-acting and low-residue toxicant for feral pigs in Australia and has since been patented." "USDA is seeking to reduce the wild pig population that roams in at least 35 states," confirms Chemical & Engineering News (October 13, 2014). "In January, it launched a national initiative that will attempt to stamp out the pervasive pigs by slipping them bait laced with a fatal dose of sodium nitrite." Feral pigs are widely believed to be a costly pest across Australia and many parts of the Southern United States. They are incredible survivors with extraordinary adaptation skills. Intelligent and resourceful, they can live almost entirely off wild subsoil onion bulbs and other small roots. (Which, for the record, makes them a whole lot smarter than most humans who would die in no time if their local grocery store stopped stocking Pop-Tarts and Oreos.) Present-day eradication techniques tend to focus on trapping and shooting the wild hogs, which is why sodium nitrite bait is typically described by USDA scientists as a "humane" option for causing rapid death without all the blood, violence and screaming. Feral pigs cause at least $100M per annum economic impact to agricultural (McLeod 2006), which is likely an underestimate, and untold damage to the environment. They are recognized as a key threatening process to threatened species and ecological communities due to their predation, habitat degradation, competition, and disease transmission. ... sound like anyone else you know? It is noteworthy that the method now being sought to kill off feral swine is to introduce a deadly chemical into their food (i.e. bait). That same exact chemical -- sodium nitrite -- has been known to be a potent cancer-causing agent since at least the 1970s, but the USDA has insisted on keeping it legal in the human food supply in order to appease the interests of powerful food corporations. 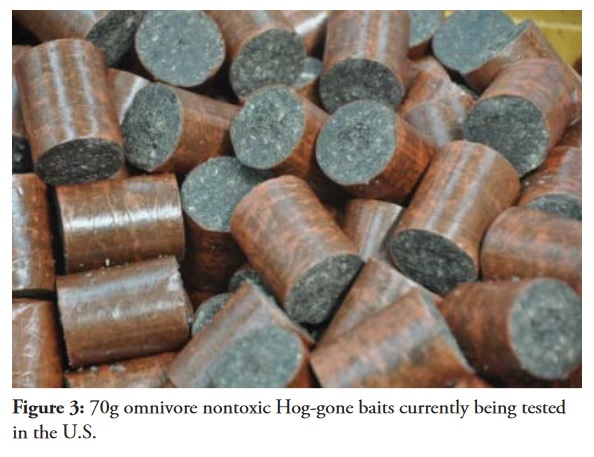 It's worth noting that if the sodium nitrite hog bait is ultimately approved by U.S. regulators for killing wild hogs, the chemical would be registered as "a pesticide with the Environmental Protection Agency for controlling wild swine," reports ACS.org. This "pesticide," by the way, is one of the primary business recruitment tools of the for-profit cancer industry. Much of today's cancer industry, it turns out, thrives on the steady supply of cancer patients produced by sodium nitrite in processed meat products. The FDA, which receives large payments of money from drug companies seeking FDA approval for cancer treatment drugs, also refuses to ban sodium nitrite from the food supply, even as a mountain of irrefutable scientific evidence links the chemical to cancers in humans. Interestingly, sodium nitrite is one of the key chemicals used by animal researchers to give animals cancer so they can study various treatments. Search science.naturalnews.com for "sodium nitrite" to see a selection of some of the research that's already been published. Or click here to search GoodGopher.com for sodium nitrite. Sodium nitrite already called a "vertebrate pesticide"
In brief, [sodium] nitrite causes methemoglobinemia, which results in rapid depletion of oxygen to the brain and vital organs. Pigs are highly susceptible to this mode of action because they lack methemoglobin reductase, the naturally occurring enzyme required to reverse the toxicosis. Nitrite causes a rapid death in domestic pigs in approximately 1 hour (IMVS 2010) and in feral pigs in 1.5 hours (Cowled et al. 2008a), with symptoms (detailed above) lasting less than 30 minutes (IMVS 2010). Nitrite toxicosis through methemoglobinemia has been independently assessed as humane (IMVS 2010). Yummm... looks like breakfast at Denny's! 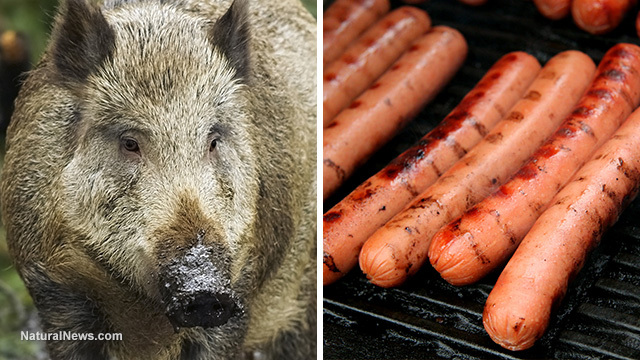 Once wild hogs are poisoned to death with sodium nitrite, they are totally safe for humans to consume, the USDA tells us. This must be very comforting to hunters to know that their federal government says it's okay to eat animals killed with a deadly poison that's been circulating through their blood and organs. "To clarify, hunters or wildlife would not be at risk from consuming sub-lethally or lethally poisoned feral pigs, as confirmed by residue testing on pen and field-poisoned feral pigs," says their report. The agency does acknowledge, however, that "Nitrite is toxic to aquatic organisms." It explains, "As such, nitrite levels are currently being assessed in three water bodies of different sizes following a worst-case scenario contamination incident (40 baits)." This means that in order to attempt to eradicate feral swine from the Southern USA, the USDA might be poisoning aquatic ecosystems even more than they are already. We may be facing a future where "sodium nitrite runoff" is added to the already catastrophic levels of atrazine, glyphosate and other agricultural chemicals that are destroying amphibians and devastating aquatic ecosystems. Bottom line: Sodium nitrite is a deadly pesticide... so why are you eating it for breakfast? The upshot of all this is that the USDA already admits sodium nitrite -- the same chemical added to bacon, breakfast sausage, lunchmeat and pepperoni pizza -- is a "pesticide" capable of killing certain mammals. Is it possible that some humans are genetically predisposed to being harmed by sodium nitrite in the food supply? Why are we feeding this deadly hog killing chemical to our schoolchildren in school lunches? In a world where the food supply is already toxic and dangerous for human consumption, the routine use of a cancer-causing chemical known to be fatal to other mammals seems insanely stupid. All who wish to avoid this deadly chemical in foods should look out for "NO NITRITES" labels on packages of bacon, jerky and sausage. Be sure to check ham soup products for sodium nitrite, and you'll also find the deadly pesticide in frozen pizzas and children's snack lunches that contain processed meat.